Small portion of the map. Click on it to enlarge. Sidney: Plan of the Township of Sidney in the District of Mecklenburgh surveyed in 1787 by Lewis Lotte; with the names of the proprietors inserted in the lots. This map measures approx. 54 x 60 cm. 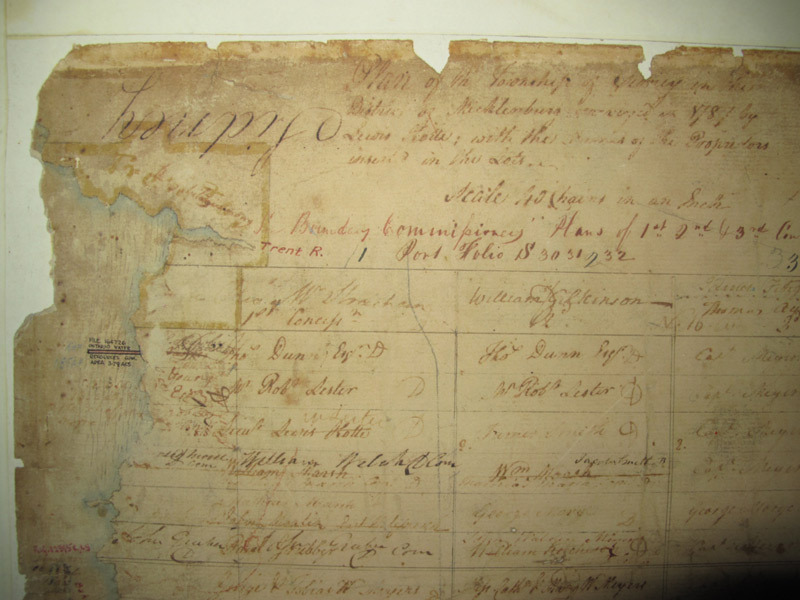 Although it is dated 1787 there are clearly additions and alterations well into the 19th C. The map shows the "proprietors" of concessions 1 thru 7 and from lots 1 to 38. 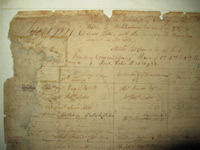 The original map resides in the land offices at Peterborough, ON. I thank Eleanor Moult UE (deceased) of Belleville, who had been active in the UEL Association and OGS for many years, for finding this map. Eleanor had a few copies produced and made one available to me. Click here to see a chart of all the names written on this map. Many of the names are of influential men who received land in Sidney while living elsewhere. There may be names on this map that do not show up in the township abstracts as land often changed hands early without the transaction ever being registered. I plan to check this out against the OLRI. Peter Johnson made these observations below about some of the men named on the Township map. WD POWELL Esq. - undoubtedly William Dummer POWELL who was a big wig in Toronto. Never lived in Sidney..
Philip EMBURY - son of Andrew EMBURY UE. He did live in Sidney for a time before moving to Madoc Tp where a tree clobbered him in 1845. Born c1785. M GRASS - likely Capt. Michael GRASS UE who lived in Kingston. George FAIRMAN - Likely George c1784 son of John FAIRMAN UE. Did live in Sidney. Buried at Vanderwater Cem. Peter SWITZER - did not live in Sidney. Matthias ROSE - did not live in Sidney. David R. KETCHESON - Earliest David R (David Roblin KETCHESON) I can find was born in 1823, a grandson of William KETCHESON Sr. UE.With names such as David KETCHESON not born until 1823, this 1787 map was much a work in progress. Capt. George SINGLETON another officer in the King's Royal Yorkers. Died 1789, but settled in 'Belleville' ahead of MEYERS so in that respect more of the 'founder' of Belleville. The various SMITHS interest me, especially those near the Front of Sidney, as John SMITH c1793 married a MEYERS granddaughter, and we have never been sure of his parents, but so likely one of these here as John lived in Sidney Tp. Arra ROSE - Thought I might see his name as the first town meeting in 1790 was reportedly held at his place. Might be the Jacob ROSE property. One of his sons was a Jacob.